Will Your Dog Go in the Snow? We deal with snow every winter at Kitchen Dog’s Michigan headquarters. Newly fallen snow can be beautiful to look at, but it can present problems for our dogs if they need to squat in it. If you’ve ever had to sit on a freezing cold toilet seat you know why! Dogs that won’t potty outside in the snow are a problem! If they hold it too long, constipation and bladder infections can result. Dogs will eliminate indoors when they feel there is no other option. Dogs appreciate a clear path to follow when they need to potty in snowy weather. Poop is easier to find when you know where to look! Start on the steps or landing so the dog can step out onto a familiar surface. Then clear a path that ends with a larger cleared area so your dog has room to circle around to stimulate their bowels. Dig deep enough that your dog can squat without sticking their sensitive areas into the snow. 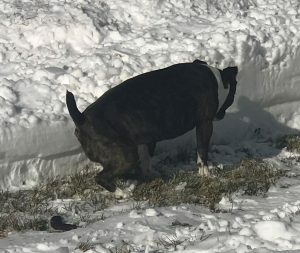 Remove enough snow to uncover some grass so the dog sees the potty surface they are familiar with. Don’t forget to also dig a path so you can access your cleanup equipment. Having a path dug makes it easy to find and remove waste. Please don’t wait until spring! Poop doesn’t melt in the snow, it will just leach into the groundwater, so remove it now. You can go a step farther and build a snow maze, especially if you have a large, busy, or agile dog that enjoys racing around in cold weather. Clear a path that circles part of the yard, including favorite spots to sniff, run, or visit the neighbors. Dogs who have a chance to run and explore outside will have less energy for mischief inside. Pay attention to the temperature and your dog’s comfort so they don’t stay out too long. If they are picking up their feet with ice trapped between the pads or getting leg cramps, bring them in to warm up. Your Dog’s Comfort is Important! Cleo has been working with dogs since she was a teenager and has spent her professional career working in marketing insights and analytics. She blogs about marketing for dog events, products, and services at the Dog Marketing Blog. For those of us that love to spoil our dogs, making homemade treats is one of the best ways to do it. Summer is the perfect time to whip up a cool treat to make your pet more comfortable during the hotter days. There are many simple recipes that require very little preparation and ingredients for the great appreciation your dog will show. Try out the recipes below for your pup’s Stamp of Approval! Place one cup peanut butter in a microwavable container and heat for 20 seconds to slightly melt the peanut butter. Add all ingredients to a large bowl and stir to thoroughly blend. Spoon or pour mixture into treat cups, till about 2/3 full. Note: the mixture will expand a bit as it freezes. Tap cups on the counter to settle ingredients, then place them on a flat surface in the freezer. Allow to freeze for a minimum of three to four hours. Remove from freezer and let your pet enjoy! Mix all ingredients and puree in blender until smooth. Pour into molds and place in freezer. Run warm water around the mold to remove the pupsicles. For your pet’s safety, remember not to add any nuts, grapes, seeds or chocolate to any of your treats, as these are not suitable foods for dogs. These treats are easy and sure to please. Let the tail wagging begin! GET IT NOW FOR $5 OFF!